Erased Symphony is based on the idea that existing cultural narratives are subject to erasure, whereby the focus is not only on evident extinction but also processes of disappearance, revaluation, densification, corrosion, etc. in the telling of national, continental, in this case Western, and hegemonial (hi)stories. In Erased Symphony the Emperor Waltz by Strauss undergoes a gradual process of erasure, albeit not the original version is modified but Arnold Schönberg’s transcription of the waltz from 1925 for flute, clarinet, string quartet, and piano. This, in turn, leads to a densification in the complexity and an overlap of historical and contemporary (cultural, political, social) narratives. Amorales already conducted a similar project in which parts of the French Code Civil were erased by jurists who he commissioned to delete, modify, or preserve certain passages according to their own views, their sense and understanding of law, justice, and ethics. Later, he printed an edited version of this book with a specially prepared plotter: He exchanged the cutter needle of the printer with a pencil so it could be erased afterwards. This special plotter is also used in Erased Symphony. 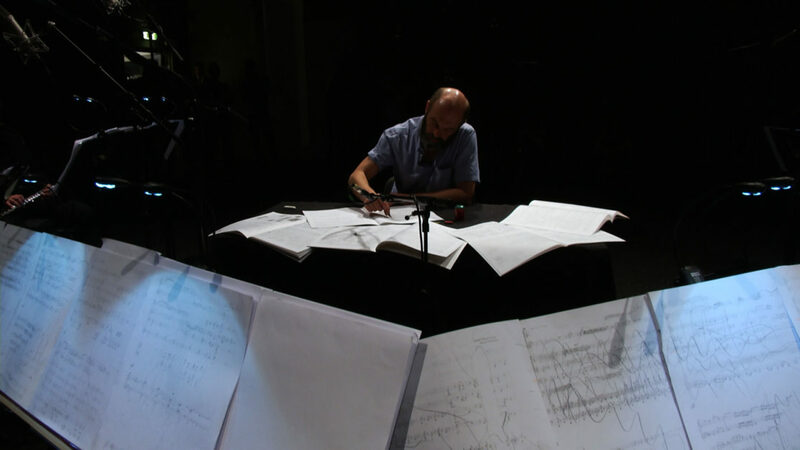 The project takes place in collaboration with Klangforum Wien, who will elaborate the erasure and interpretation of Erased Symphony in a close dialogue with the artist and perform it live at the opening of Donaufestival. The adaptation of Arnold Schönberg’s Emperor Waltz op. 437 for flute, clarinet, string quartet and piano (1925) is made possible with the kind permission of Belmont Music Publishers, Los Angeles and SCHOTT MUSIC GmbH & Co. KG . Klangforum Wien: Thomas Frey, flutes / Olivier Vivarès, clarinets / Annette Bik, violin / Fani Vovoni, violin / Lena Fankhauser, viola / Andreas Lindenbaum, violoncello / Joonas Ahonen, piano. A production by donaufestival in cooperation with Klangforum Wien. The video was filmed and edited by Julien Devaux. “Supprimer, Modifier et Preserver” is a work that deals with and challenges the notion of right as an independent, organic, rational and complete system, as well as how much and to what extend it can be considered an expression of the will of the ‘people’. Given that codes and constitutions are important historical documents influencing society and over determining its values, this work encourages re-thinking the social rules that govern us, individual responsibility within larger political debates, the importance of a sharp division between public and private law and of the making and meaning of such constructs.